The final fight to pick the ultimate winner in Senegalese wrestling, initially scheduled for January 13 at Pikine's National Wrestling Arena, finally took place at the Léopold Sédar Senghor Stadium in Dakar. The wrestling match was moved from one venue to another to allow more spectators to enjoy the legendary fight between Balla Gaye 2 and Modou Lô, according to Gaston Mbengue, the fight's promoter. It took a lot of negotiations for this change of venue to be approved, he said. The Léopold Sédar Senghor Stadium in Dakar, built by the Chinese in the 1980s with a capacity of 60,000 seats, has extensive experience in hosting major competitions. Therefore, it is no wonder that this infrastructure was chosen to host one last great fight before being closed for renovations. To lighten the schedule at the already-overburdened Léopold Sédar Senghor Stadium, Senegal decided to build a brand new wrestling arena. This was a major event for the country, where wrestling and football have long been competing for the title of "national sport." The new national wrestling arena is based in Pikine, the second most populated city in Senegal after Dakar. Although it missed the chance to host the "fight of the decade," the new national arena is already showing its value. To close the last wrestling season of 2018, the new arena hosted the matches that launched the unparalleled winning streak of Eumeu Sène, who beat defending champion Serigne Ousmane, aka "the Bombardier." Other great Senegalese wrestlers fought there in front of an admiring audience. This arena, which is now fully operational, was long overdue. In fact, wrestling professionals had been complaining for many years about the lack of professional-grade wrestling venues in Senegal. Many had no other choice but to hold their matches in football stadiums. It therefore made sense for wrestling matches, whose popularity in Senegal is unrivalled, to have their very own professional infrastructure. Sponsors and TV broadcasters are now fighting over the best seats in the new Pikine arena, eager to see the best fighters in the country and the region come to blows in the new infrastructure. It is something that legendary wrestlers of previous generations, such as Yahya Diop, aka "Yekini," and Mohamed Ndao, aka "Tyson," never experienced. Senegalese wrestling has also improved its notoriety, professionalism and international popularity over the years, especially with the arrival of new wrestlers from various backgrounds. Former European grappling champion Spaniard Juan Espino, aka "White Lion," Frenchman Fabrice Allouche, aka "White Wizard," and Aurélien Duarte, former boxing champions in the 1990s, as well as former American wrestler Bob Sapp, have all joined the ranks of the best Senegalese wrestlers. These athletes, who have made their reputation in other sports, are now helping Senegalese wrestling spread its popularity overseas. Now broadcasted live on television, wrestling matches are watched by thousands of spectators and supported by a number of high-profile sponsors. Such sponsorship helps cover organizational costs and remunerate wrestlers, whose salaries can sometimes reach up to several tens of thousands of dollars per match. Seen from afar, the Pikine National Wrestling Arena looks almost like a bird's nest, and is reminiscent of China's National Stadium in Beijing, built for the 2008 Beijing Olympics. Upon closer examination, people can see that the new arena is actually a multi-sport complex surrounded by playgrounds where young people, amateur athletes and others can exercise. The arena also has an impressive accommodation center, a gym, many changing rooms and two car parks. Inside the arena, the stands allow close viewing of sports events and can be transformed into an area that can accommodate a variety of sports such as boxing, martial arts, fencing, weightlifting and gymnastics. The entire infrastructure is wired and equipped with connections and covers an area of 18,000 square meters. The project was carried out by a subsidiary of China's Hunan Construction Engineering Group (HNCEG). Over 28 months, as the Pikine National Wrestling Arena was taking shape, the company recruited more than 1,000 local technicians to work on the project. HNCEG also made a point of providing professional training to local employees. According to figures provided by HNCEG, nearly 3,000 Senegalese employees have learned the necessary skills and knowledge needed to conduct future maintenance of the infrastructure in an independent manner. This is a major aspect that will help secure long-term employment on the site. The new arena was officially inaugurated during the state visit of Chinese President Xi Jinping to Senegal, on July 22, 2018. The highlight of the inauguration took place when Xi handed over, in a symbolic gesture, the keys of the new arena to Macky Sall, his Senegalese counterpart. The Pikine National Wrestling Arena then hosted a large-scale choreography of wrestlers, symbolizing the deep friendship between the two nations. Indeed, wrestling in its various forms is an ancient sport deeply rooted in the cultures and traditions of both Chinese and Senegalese peoples, according to experts. This new infrastructure, which will host fights between the younger generations of Senegalese wrestlers, as well as international wrestling matches and competitions of other sports, is often described as a "jewel" by the Senegalese press. The project was financed by China for a total of 32 billion CFA francs ($57.6 million). Some observers say the new arena is a concrete incarnation of the many benefits of the fruitful bilateral cooperation between China and Senegal. 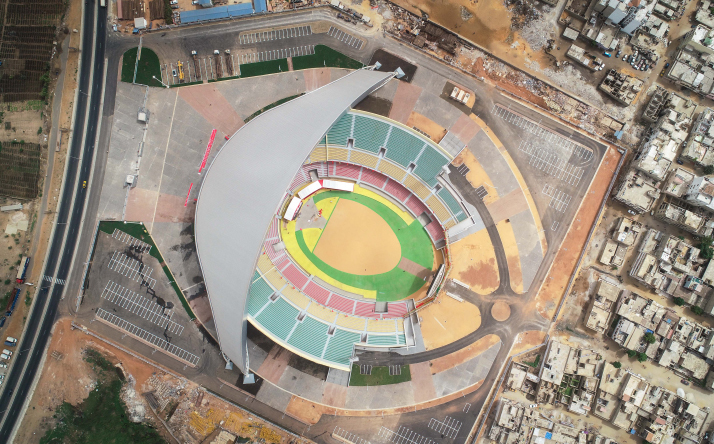 Moreover, in the coming days, the complete restoration of Léopold Sédar Senghor Stadium in Dakar will begin - another bilateral cooperation project carried out by Chinese partners in Senegal. A restoration agreement providing for 40 billion CFA francs ($72 million) in financing was recently signed by the two countries for this project. Since the resumption of their diplomatic relations in 2005, China and Senegal have continued to strengthen their economic and trade ties. Before the inauguration of the Pikine National Wrestling Arena, on July 21, 2018, Senegalese and Chinese leaders witnessed the signing of 10 bilateral agreements related to justice, economic and technical cooperation, infrastructure, human capital development and civil aviation. Such close-knit partnership between China and Senegal has increased the trade volume between the two countries to $2 billion in 2016, especially in the field of infrastructure projects, according to official Senegalese figures. In terms of trade, China is Senegal's second largest importer, with the value of imports rising from 227 billion CFA francs ($408.6 million) in 2013 to 367 billion CFA francs ($660.6 million) in 2017.